"Casket with the story of Paris"
Italian (Venice), early 15th century. Workshop of Baldassare degli Embriachi. 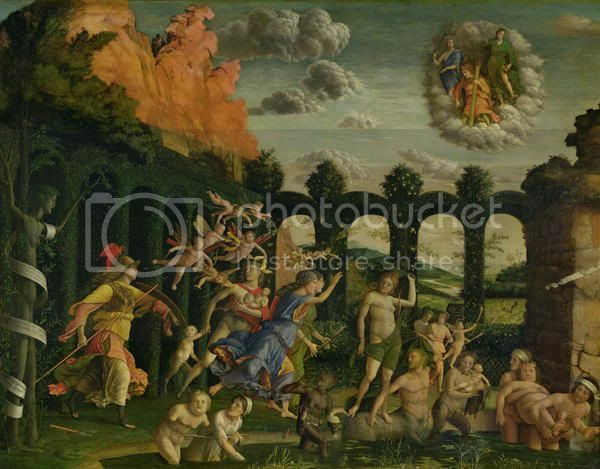 From Venice, by Giovanni Bellini (whose brother-in-law was Andrea Mantegna, by the way), is this amazing representation of Temperance - certainly far more removed than the ones I had in mind! Louvre, 1500-02, Figure 3). Isabella described the idea for it as “a battle of Chastity and Lasciviousness, that is Pallas and Diana combating vigorously against Venus and Cupid.” The goddess, Diana, however, is not pictured in the painting. Here we have two virgins, Athena and Daphne, driving out Lust and the Vices from the garden. Three of the Cardinal Virtues, Temperance, Justice, and Fortitude, having been driven out previously by the depravities which had been occupying the place, return to the garden in an oval cloud formation. white fluttering banner reflects her cry for help." "1. Compare in Mantegna's painting the Virtues which observe the battle from on high; an inscription even speaks of the Mother of Virtues (Et mihi virtutum matri succurite divi) which according to Foerster would be Truth, invisible." "Put sloth aside, and at once you break in twain the shafts of Love; his torch is out, and henceforth is but a thing for jest and mockery. As the plane tree loveth wine, as the poplar loveth the pure stream, as the marshy reed loveth slimy soil, so doth Venus delight in idleness. Love flees from toil; if, then, you would banish love from your heart, find some work for your idle hands to do and then you will be safe. Dolce far niente, too much sleep, gambling, and overmuch wine-bibbing cloud the brain and, though they deal it no serious wound, filch away its energy." Campbell, Stephen J. 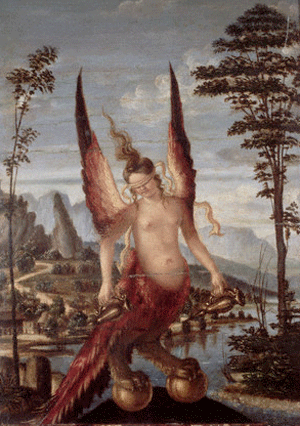 The Cabinet of Eros: Renaissance mythological painting and the studiolo of Isabelle d'Este (Yale University Press 2004). A page from A Collection of Emblemes Ancient and Moderne by George Wither, link first posted by Hoo on the Books of Fortunes and Dreams thread. A different slant on Temperance from the 'watering of the wine' angle. Pour out enough; but do not spill. Pen wrote: A page from A Collection of Emblemes Ancient and Moderne by George Wither, link first posted by Hoo on the Books of Fortunes and Dreams thread. A different slant on Temperance from the 'watering of the wine' angle. Emblemata : Volsinnighe uytbeelses / by Gabrielem Rollenhagium uyt andere versamelt/ en vermeerdert met syn eygene sinrijcke vindingen/ Gestelt in Nederduytsche Rijme Door Zacharis Heyns. Thanks Huck... I guess I should check that the English translation of the original is accurate rather than poetic before attributing a slightly different angle to Temperance. It's just so good to find an English emblem book I haven't seen before, let alone one with fortunes that relate to the images. Pen wrote: Thanks Huck... I guess I should check that the English translation of the original is accurate rather than poetic before attributing a slightly different angle to Temperance. It's just so good to find an English emblem book I haven't seen before, let alone one with fortunes that relate to the images. If you click at "tables of content" for the relevant author, it seems, that you get the content. I'll check it out - thanks. In the meantime I looked at the earlier emblem (below) - the English translation seems accurate as far as I can tell without parsing the Latin. .... well, the quality is better in the original source.